The collapsible calendar panel allows you to quickly see tasks due today, tomorrow, or on any other date or multiple dates. But it can also do much more. If you learn to use the calendar panel, you will be able to quickly get a complete overview of important deadlines, meetings or appointments. This will help you to stay on top of things, eliminate stress, and give you the much needed room to focus. Nothing urgent will suddenly surprise you. As you can see below, the calendar panel is located below the to-do list tree, and is collapsed by default. With just one click, you can open it and see only tasks due today – or on any other date – or on multiple dates. The Calendar Panel is located below the to-do list tree. You can show or hide it using the menu View - Calendar Panel. When the calendar panel is open, it is always filtering the view. At least one day is always selected in the calendar. If you want to view your tasks unfiltered by the calendar, you need to close (collapse) the calendar panel by clicking the "Close Calendar" label. Once you close the calendar, the original view will be restored. Your software (Swift To-Do List Ultimate) is GREAT. I know many other software and finally I found yours and THIS is THE BEST form me! ;-) Fast, intuitive ... I worked before with a very complex software and I found it's really hard to operate and how much time I waste just on operating with a software ... My decision to move into Swift ... was very good. The calendar mode determines using which date the calendar filters your tasks. For example, if you use it in the Due Date mode, it will show all tasks due on the selected day(s). By clicking the "Calendar Options" button, located left to the Close/Open Calendar label, you can change the calendar mode. and, various date combinations, such as "Start Date or Due Date"
You can select multiple days in the calendar. Simply hold the Ctrl key while clicking the additional days to add them to the current selection in the calendar. Or, you can select multiple dates by using just the mouse, by doing a drag selection. To do that, move mouse over any particular date, then press and hold the left mouse button, and move the mouse to the desired end of the date range selection. This way, you can select any particular week, month, or other time periods. Resizing: The calendar can display multiple months at once. 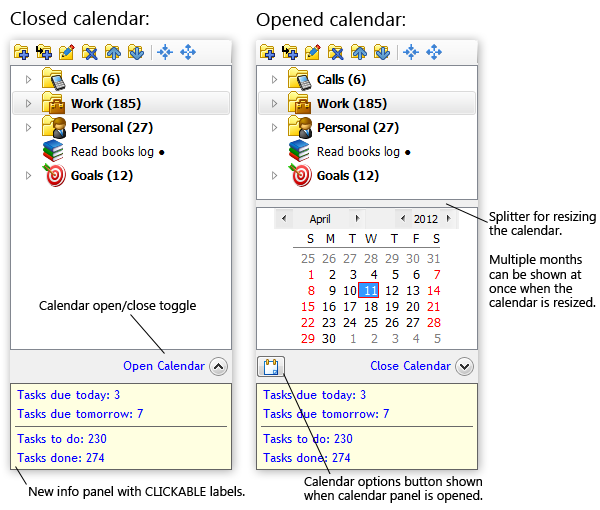 Above the calendar is a separator (splitter) which allows you to resize the calendar. It works the same as when you are resizing the notes panel, or adjusting the width of the to-do list tree. Also, if you increase the width of the to-do list tree, the calendar panel will take advantage of the space and display multiple months when possible. Font and colors: The calendar uses the same font, font size, font color and background color as the to-do list tree. If you are adding a new task, and a single date is selected in the calendar panel, the task will have that date set by default. For example, say that: The calendar is in the Due Date mode, it is opened, and today's date is selected in it. If you add a new task, it will have today's date set as its default Due Date. This is just one of the many great features in Swift To-Do List.